Panasonic has revealed a fleet of new TVs for 2014 at its annual convention, with the pick of the litter being the introduction of a new 4K Ultra HD Viera AX900 series. While the Viera AX900 isn't going to be arriving in the UK until the autumn, Panasonic unveiled it in a blaze of glory in Amsterdam today, literally employing onstage fireworks to reveal the new telly. However, the company was heistant to reveal any specs and was instead intent on letting us know about its flagship of the moment, the Panasonic Viera AX800. Available in screen sizes of 50, 58 and 65-inches, the AX800 series will be arriving in stores later this spring. Alongside the AX800 series came the AS800 series which, although being a step down in Panasonic's lineup, is nevertheless a 4K Ultra HD TV with all the usual smart functionality. The AS800 series includes 47, 55 and 60-inch models. 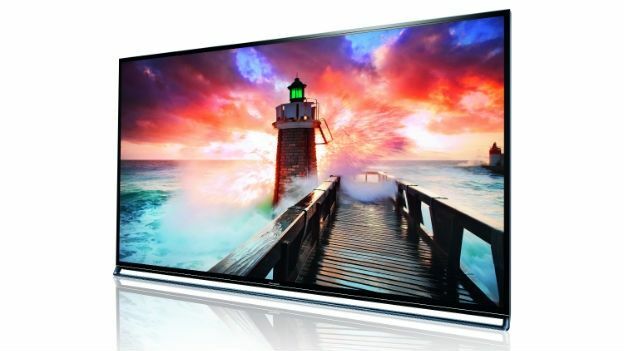 Both series consist of LED LCD panels, confirming the demise of plasma. Offering a bleeding-edge 3,840 x 2,160 pixel resolution, the AX800 series uses a Hexa Processing Engine PRO chip to maximise the image quality for both native 4K content and regular ol' HD material. In terms of what 4K content you'll actually be able to watch, well, there still isn't really any yet. However, Panasonic also announced it has extended its sponsorship of the Olympic Games up until Tokyo 2020, by which time it says that 4K will be the adopted standard. Alongside the visuals are the new Smart TV features Panasonic has built in, including what it calls the "Info Bar". It's a strip of notifications such as weather, news headlines or incoming messages, that runs along the base of the screen. Where it gets clever and, potentially, a bit unnerving, is that the info bar works with the TV's built-in webcam and proximity sensor to detect when you're in the room to automatically display notifications even when the TV is turned off. Similarly, the built-in face recognition technology means it can be tailored to different family members. Using the Panasonic TV Remote 2 app, you can also send a text, picture or video to the TV, addressed to another member of the family, while you're out of house. The Japanese company even likened it to leaving post-its on the fridge. The comapny hasn't yet revealed pricing or a firm UK release date for the AS800 or AX800 series, but we'll update you as soon as we hear more.